1 - In the slow cooker stir in all the ingredients together, (except the meat AND the Cream Cheese). Once combined add the meat and mix together. 2 - Cook on Low for 8 hours. 3 - Cut up the cream cheese into cubes just before serving and turn crockpot on high. Stir the cream cheese in until all combined. You might have to put the lid back on and leave for 10 minutes. 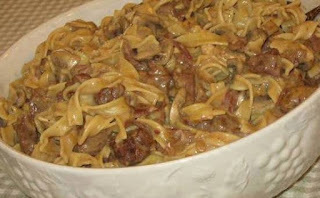 4 - Cook Noodles, You can put it all in a big dish and mix together or add noodles to your plate and spoon beef stroganoff on top.